A computer can be anything you want it to be. If the basic hardware is there, you can turn it from anything from a home entertainment center to a small office. New York Democrats are a lot like that. When Kirsten Gillibrand became Hillary Clinton's replacement as a Senator from New York, she had a record of being an upstate congress woman with centrist views. When she was tapped by Governor Patterson to fill Hillary's shoes, she veered sharply to the left. It seemed as though she had been reprogrammed to forget some of the upstate political values that actually have a quiet following downstate in New York City as well. There was a little bit of hope when Harold Ford, a Democrat from Tennessee was talking about challenging Gillibrand. Now it seems that he is bowing out, leaving New York's lapdog Democratic Senator unchallenged for the time being. Fox News reports as follows. "Harold Ford Jr., the former Tennessee congressman, won't run against Kirsten Gillibrand for U.S. Senate in New York's Democratic primary, Fox New confirmed. A source told The Associated Press Ford would explain the reasons for his decision in an op-ed in The New York Times. The person spoke on condition of anonymity because the decision has not been announced yet." Thanks to Mike Bloomberg and political correctness, there are no more smoke filled rooms. But it seems that there are a lot of deals being cut behind closed doors. Governor Patterson has just decided not to run for Governor of New York. Allegations of a phone call to a woman who was filing criminal charges against his top assistant have Patterson looking like damaged goods. The only smoke that there might be behind closed doors is the clouds of incense as Andrew Cuomo is anointed as the Democratic candidate for governor. Like North Korea, Cuba and China, there is only one party nomination that really matters. In New York, it is the Democratic primary that is watched. The first question that crosses my mind when I hear that the New York Times in investigating Governor Patterson is not "What did Patterson do wrong?' but "Who did Patterson tick off?" When I look at what Harold Ford bowing out of the Senate race and Patterson trying to ignore calls for his resignation as Governor, it seems that the Democrats are trying to avoid an image of total disarray. 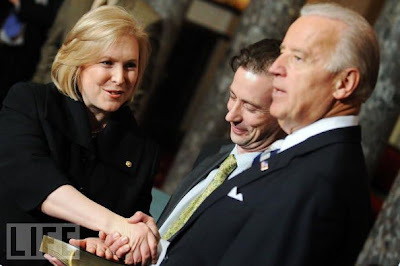 Kirsten Gillibrand does not strike anyone as a charismatic, dynamic or capable Senator. Ford was beating her at fund raising. But New York State Republicans would be more than happy to zero in on a Democratic Party that looks like it is in chaos. Some of our elected leaders seem to have decided that a stressed out electorate needs an election that is about as bland as farina without salt. No challenge to Senator Gillibrand seems to be on the horizon. Does anyone remember the old Batman episodes when the villain used to spray sleeping gas in the bank before he robbed it? Our elected leaders are doing the best they can to put us to sleep with bland, uninspiring candidates. To paraphrase the song from Green Day "Wake me Up When November Ends".